Family dynamics are always interesting. Many people wonder why siblings can have such different personalities, after all they come from the same stock and have more or less the same early environmental factors. The difference is often put down to the dynamic between the siblings. There is a theory of birth order that suggests the first born would tend to be a perfectionist because the new parents are trying to do it all by the book. So first born children would be reliable, conscientious, structured, cautious, controlling achievers. I was the oldest in the family and could tick most of those boxes but feel that it has more to do with being a triple Capricorn. The middle child in a family gets less attention and is less of a perfectionist. They would tend to be people pleasers and peacemakers who have a large social circle. They also tend to be rebellious. My sister is certainly rebellious but not particularly any of the other features. She has the Sun in Aries and the Moon in Aquarius and has a much stronger sense of herself than is generally attributed to middle children. The youngest of the family a suposed to be free spirited owing to the parents increasingly relaxed attitude. They are fun loving, outgoing attention seekers, manipulative and self centred. My youngest sister could not be further from these traits but she has a Sun / Saturn conjunction in Pisces. Whenever I look into other methods of explaining or understanding personality, I am staggered by how narrow simplistic and off the mark they are. Every child in a family has a unique astrological chart, so they are all different. But there are often family themes that they share. This is particularly the case with twins. Mario and Aldo Andretti were Italian American racing drivers. Apparently they were both obsessed with cars from the age of two. At the age of 19 they rebuilt a Hudson Hornet into a stock car and began racing it. They flipped a coin to see who would race in the first race. Aldo won the coin toss, the heat race and the feature. They both won two races in their first season. Aldo however, fractured his skull in a serious crash near the end of the season. He recovered from his coma, and he returned to racing but was never quite the same. Mario became one of the most successful Americans in the history of the sport. He is one of only two drivers to win races in Formula One, IndyCar, World Sportscar Championship and NASCAR. Mario had a long career in racing. With his final IndyCar win in April 1993, he became the first driver to win IndyCar races in four different decades. His name has become synonymous with speed, similar to that of Stirling Moss. In August 1969 Aldo suffered severe damage to his face after crashing into a fence, and quit racing. His face had 14 fractures to his facial bones. Strangely Mario had a similar accident in June 1969 when his face was scorched in a flame-out, but this was nowhere near as severe as his brother’s and he continued with a successful career. 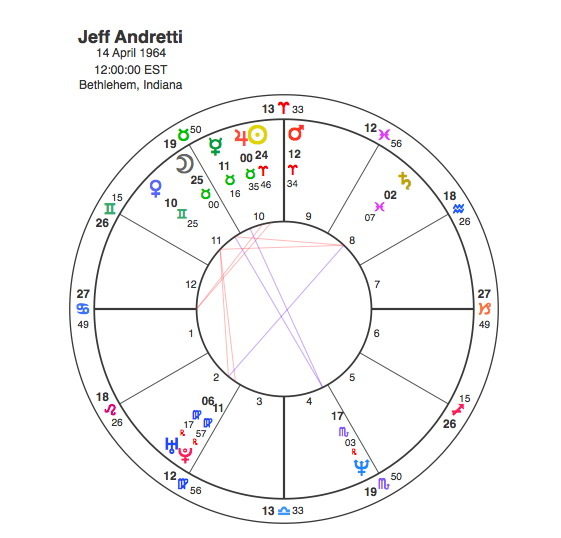 Its interesting to look at their charts to see if there is a connection with motor racing but also to notice whether their are any differences that might explain how their careers diverged. The most common Sun sign in this sample is naturally Aries with 18, but it might be surprising to see that Pisces is the 2nd with 16. The p figure for this distribution is 0.000186, absolutely staggering for a sample so small. Mario and Aldo were both Sun Pisceans with the Moon in Scorpio, but unusually for twins they were born 5 hours apart so there is quite a difference in house positions and rising signs. Mario, the successful one, has Capricorn rising with the Sun in the 1st house. His brother Aldo has Gemini rising with the Sun in the 10th. They both have a powerful Venus / Jupiter conjunction in Aries which would show their love of racing. They also both have a Moon opposite Mars which would also point to a strong desire for excitement. Their Moons are opposite Uranus and this factor brings Mars and Uranus together in wide conjunction. Mars and Uranus are the classic aspect of accidents. As drivers at the time they were racing, accidents were fairly common, but its interesting to look at the relative positions of their Mars / Uranus / Moon aspect. Mario had his from the 3rd to the 9th house, both houses are concerned with travel and movement. Aldo had his from the 12th to the 6th, houses to do with health and hospitalisation. Also Aldo’s opposition created a T Square to his Midheaven, which showed that his accidents had a disastrous impact on his career. 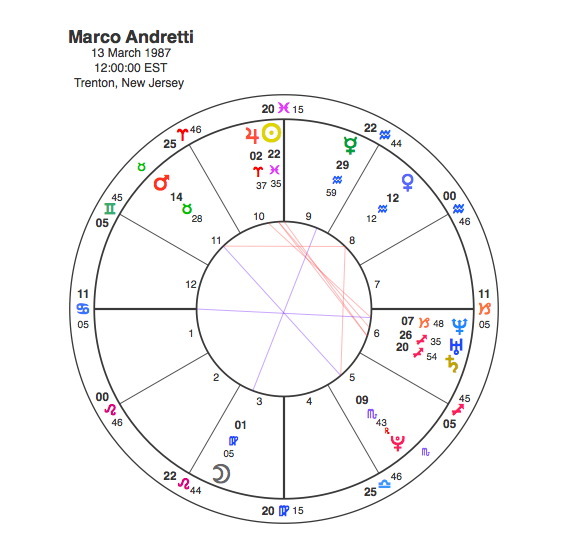 In 1959 when they started racing, the Andretti brothers both had Neptune opposite their Mars and Uranus repeating its natal contact with the Moon, this time by square aspect. These would be appropriate transits to stimulate the beginning of a racing career, but of course in Aldo’s case Uranus was also opposite his Midheaven, having disruptive effect. In 1969 when they both had accidents, Saturn was conjunct their Mars. But for Aldo it immediately went on to square his Midheaven and his accident was serious enough to force him to retire. The Andrettis both had two sons that followed them into motor racing. Mario’s boys were Michael and Jeff, Aldo’s were John and Adam. Mario’s grandson and Michael’s son Marco still races for the Andretti team. Birthtimes are not available for any of the boys but there are certain patterns that repeat themselves. John was another Pisces, he had the Sun conjunct Jupiter so a sign of a fortunate birth giving him his racing inheritance. His Mercury is also in Pisces in conjunction with Mario and Aldo’s Suns. This Mercury is opposite Uranus and Pluto showing the appeal of the excitement of racing. Jeff was an Aries but like John had a Sun / Jupiter conjunction. Jeff’s Mars was closely conjunct Mario and Aldo’s Jupiter. His Saturn was conjunct their Suns. Like John the planet that was in this position was opposite Uranus and Pluto. In his case, however it was part of a T square that focused on an apex Venus in Gemini. There is something called the Andretti Curse, referring to the unexplainable bad luck the Andretti racing family has experienced in their efforts to win the Indianapolis 500. Mario Andretti won the race only once despite many attempts. The whole family have a total of 69 starts as drivers, but none of them have won it since then. Jeff was particularly unfortunate in Indianapolis in 1992 when a right rear wheel came loose off his car at Turn 2 and he crashed violently head-on into the wall, smashing both his legs. The accident severely hampered Andretti’s career, at least in terms of his competitiveness, since he was never the same afterwards. Pluto was opposite Jeff’s Moon at the time. Adam Andretti had a Aries / Pisces combination. Adam’s Sun and Mercury was in Aries with his Mars in Pisces. Adam also benefitted from a Sun / Jupiter contact, in his case a flowing trine. Michael was the most successful of the junior branch of the Andretti family, but he was the only one who wasn’t an Aries or a Pisces. He was also the only one without a close Sun / Jupiter aspect, but he did have a connection. Michael’s Jupiter was conjunct Mario and Aldo’s Sun. This Jupiter was also opposite the Uranus / Pluto conjunction. Michael’s Sun Marco was definitely a chip off the old block. Marco had the Sun in Pisces conjunct Jupiter in Aries. His Mars was in Taurus conjunct that of both his grandparents. The Aries / Pisces connection runs through the whole family. All of the 2nd and 3rd generation had powerful Jupiter connections. When it comes to it astrology is a lot better at explaining family dynamics than any other method. And that applies to whatever race we are running.